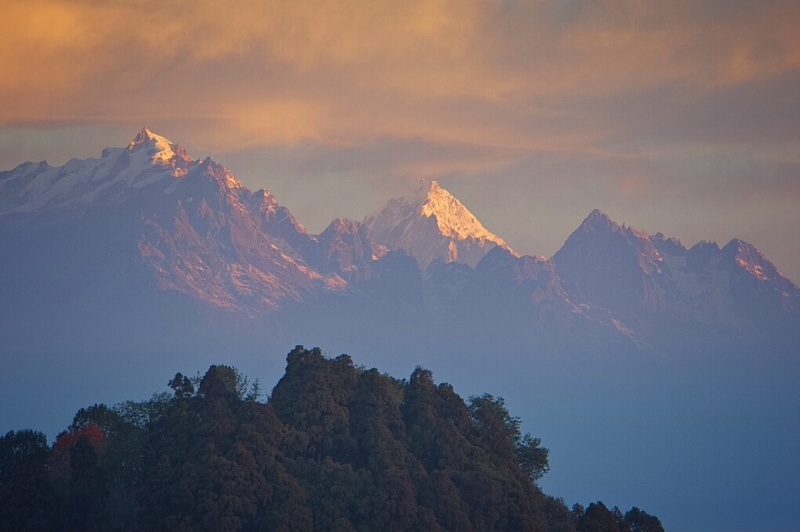 I've posted some photographs of Kanchenjunga, the world's third highest mountain, at sunrise and sunset on my instagram page, but Kangchenjunga wasn't the only mountain in the view from the rooftop of my hotel in Darjeeling. If anyone knows for sure which mountain this is, please let me know. I arrived today in Pelling in Sikkim, much closer to Kangchenjunga, but the mountain's remaining stubbornly hidden behind cloud and the first light rain I've seen since early November. Top bit looked like a rather trite painting, until I scrolled down. The trees at the bottom root it, and make the top more impressive, and a bit surreal. Zhoen, yes. It needs that dark hill with the trees.